This was my second piece published in The Gooner, though I think it was the first I wrote. It’s amazing how many people have never even heard of the International Football Association Board (IFAB). Most people think FIFA make all the rules these days, but the UK football associations still have a lot of power. This is one big reason why a lot of FIFA representatives don’t like England. Not much about Arsenal in this one, though I did work in the odd mention. 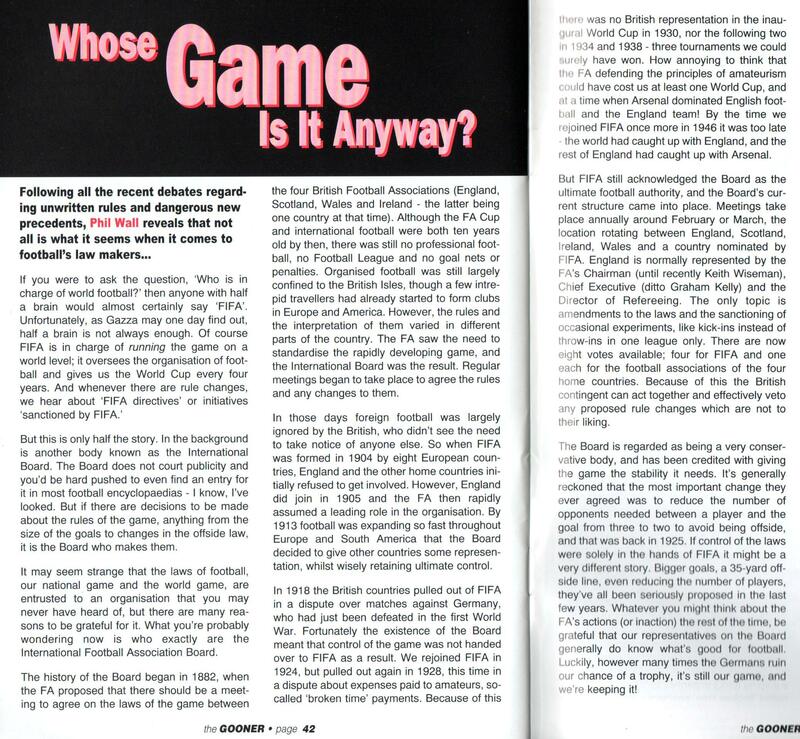 This is from Gooner issue 94, March 1999. But this is only half the story. In the background is another body known as the International Board. The Board does not court publicity and you’d be hard pushed to even find an entry for it in most football encyclopedias – I know, I’ve looked. But if there are decisions to be made about the rules of the game, anything from the size of the goals to changes in the offside law, it is the Board who makes them. It may seem strange that the laws of football, our national game and the world game, are entrusted to an organisation that you may never have heard of, but there are many reasons to be grateful for it. But you’re probably wondering who exactly are the International Football Association Board. The history of the Board began in 1882, when the FA proposed that there should be a meeting to agree on the laws of the game between the four British Football Associations (England, Scotland, Wales and Ireland – the latter being one country at that time). Although the FA Cup and international football were both ten years old by then, there was still no professional football, no Football League and no goal nets or penalties. Organised football was still largely confined to the British Isles, though a few intrepid travellers had already started to form clubs in Europe and America. However, the rules and the interpretation of them varied in different parts of the country. The FA saw the need to standardise the rapidly developing game, and the International Board was the result. Regular meetings began to take place to agree the rules and any changes to them. In those days foreign football was largely ignored by the British, who didn’t see the need to take notice of anyone else. So when FIFA was formed in 1904 by eight European countries, England and the other home countries initially refused to get involved. However, England did join in 1905 and the FA then rapidly assumed a leading role in the organisation. By 1913 football was expanding so fast throughout Europe and South America that the Board decided to give other countries some representation, whilst wisely retaining ultimate control. In 1918 the British countries pulled out of FIFA in a dispute over matches against Germany, who had just been defeated in the first World War. Fortunately the existence of the Board meant that control of the game was not handed over to FIFA as a result. We rejoined FIFA in 1924, but pulled out again in 1928, this time in a dispute about expenses paid to amateurs, so-called ‘broken time’ payments. Because of this there was no British representation in the inaugral World Cup in 1930, nor the following two in 1934 and 1938 – three tournaments we could surely have won. How annoying to think that the FA defending the principles of amateurism could have cost us at least one World Cup, and at a time when Arsenal dominated English football and the England team! By the time we rejoined FIFA once more in 1946 it was too late – the world had caught up with England, and the rest of England had caught up with Arsenal. But FIFA still acknowledged the Board as the ultimate football authority, and the Board’s current structure came into place. Meetings take place annually around February or March, the location rotating between England, Scotland, Ireland, Wales and a country nominated by FIFA. England is normally represented by the FA’s Chairman (K. Wiseman), Chief Executive (Graham Kelly) and the Director of Refereeing. The only topic is amendments to the laws and the sanctioning of occasional experiments, like kick-ins instead of throw-ins in one league only. There are now eight votes available; four for FIFA and one each for the football associations of the four home countries. Because of this the British contingent can act together and effectively veto any proposed rule changes which are not to their liking. The Board is regarded as being a very conservative body, and has been credited with giving the game the stability it needs. It’s generally reckoned that the most important change they ever agreed was to reduce the number of opponents needed between a player and the goal from three to two to avoid being offside, and that was back in 1925. If control of the laws were solely in the hands of FIFA it might be a very different story. Bigger goals, a 35-yard offside line, even reducing the number of players, they’ve all been seriously proposed in the last few years. Whatever you might think about the FA’s actions (or inaction) the rest of the time, be grateful that our representatives on the Board generally do know what’s good for football. Luckily, however many times the Germans ruin our chance of a trophy, it’s still our game, and we’re keeping it! ← Squad Strength: Half of ManU and Chelsea?